Do you ever find yourself setting an ambitious health or fitness goal, working hard towards it for a couple of weeks and then giving up before you can see any impact? I know I have, setting really lofty targets and then burnout or get bored super quickly. I was never the kind to stick to a fitness plan. I’ve tried yoga, swimming, weights, and a few different diets under my buddies’ recommendation. But every time, I would inevitably end up going back to unhealthy habits. Until I decided to make a healthy lifestyle bucket list. I applied the idea of a bucket list to my new year resolutions in 2016 and listed down the fitness goals I want to achieve by the end of the year. When I say “bucket list”, I mean routines that I wanted to incorporate into my lifestyle. My fitness goals fed through to this bucket list. I wanted to increase flexibility, so I aimed to do yoga every day. To increase my endurance levels, I added doing team sports twice a week to my bucket list. I also wanted to gain more muscle, so I added two a minimum of two weights sessions each week, going with a friend to help us motivate each other. Translating these fitness goals into achievable, and seemingly more fun bucket list items definitely made it easier to achieve my targets. There are several benefits to this type of goal-setting. It motivates me to keep going. Ticking off milestones I’ve reached gave me a sense of achievement. I’m done with this, now on to the next one. It started, for example, with the “30 days yoga” challenge. Once that was done, I moved onto the “100 day challenge”. Now I’m aiming for two years… Sure, there were times I didn’t want to exercise or wanted to binge on my favourite junk food after a long day. Though my muscles were sore for days after my first two weeks of doing weights, I kept going by treating myself to a day of watching my favourite series or bought myself that shirt I’ve been eying after reaching certain milestones. It shows concrete steps. The goals I set weren’t the abstract and vague plans for the future. Rather, they were small but clear steps that made sure I wouldn’t be overwhelmed with my next steps. In turn, I didn’t want to stop or “take a break” because I felt that I had so much going on and I didn’t want to break the rhythm I’d created for myself. I can pinpoint milestones and goals. The #1 goal I wanted to achieve was to gain muscle, lose my body fat percentage and increase my flexibility the end of the year. This narrows down the kind of exercise and diet I should follow, and helps me define what exercise I should be doing – namely weights, interval training (or team sports) and yoga. It’s reasonable. Everything I put down had a direct relation to my end goal. My nutrition plan made sure that I was eating the right amount of protein and carbohydrates so my body could function properly during my workout. I actually made the shift in mentality from being “on a diet”, to concentrating more on optimal nutrition and making positive lifestyle changes. Every change in my workout regimen made sure that my body didn’t stagnate with the exercise I was doing. I have a deadline. I don’t have an excuse to put it off. I want to achieve this by the end of the year. I have an end date in mind. Then, I would compare the changes I’ve seen in my body since I laid out my fitness bucket list. It also helped to put a specific goal I wanted to achieve by the end of each month. For the first month, I wanted to get into the habit of working out at least four times a week. The next month, I wanted to cut down on chocolate, and eventually I would carry these goals over to the following months. Setting smaller, specific goals really helped me stay in focus of the steps I needed to take. It’s not a jump from point A to Z, I have to go through the entire alphabet. And I’m still only halfway there! 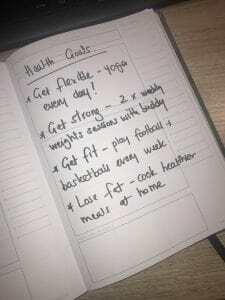 What are your health goals? Let us know on our Facebook page!